Coming from two different backgrounds, Filipino and European (Croatian, Italian and German), it is always hard for me to choose something specific from my mixed culture. Despite this, the special food that comes to mind is from my Filipino side: puto. 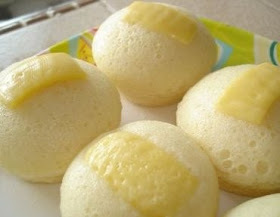 Puto is a steamed rice cake that is very popular in the Philippines and is sometimes made with flour. There are different variations to this recipe; sometimes, we would add bits of cheese for a softer and saltier effect. Other puto recipes are made with rice. I chose this recipe because it is an important part of my family's holiday celebration. Puto is a very popular Filipino dessert, which is eaten throughout the year. However, my family only eats it on special occasions. Every year, my mother and I would make this dessert on Christmas morning and on New Year's Day to eat with the day's meals. Although we usually just make these during the holidays, we would sometimes make them for other special occasions such as birthdays, Thanksgiving, and Easter. To me, this dessert is the ultimate food because it is perfect to eat on it's own, for breakfast or as an accompaniment with a main dish. Along with puto, we usually eat foods from my alter-background. This exact recipe is the recipe my mother has been using since her childhood days in the Philippines. It is a good substitute for the traditional “North American” cake and is eaten without added toppings like frostings, etc. 1. Boil water in a steamer. 2. Combine all ingredients with an electric mixer. 3. Pour into puto molds/cups*, full. * These cups must be plastic. Small plastic containers/tupperware can be used as well. 4. Place 4 at a time. 5. Remove from steamer when the putos are firm. 6. Insert a toothpick to make sure the inside is not gooey. A group of students in the class of World Views on Food Production from Vanier College in Montreal, Canada share a special recipe from their own culture.